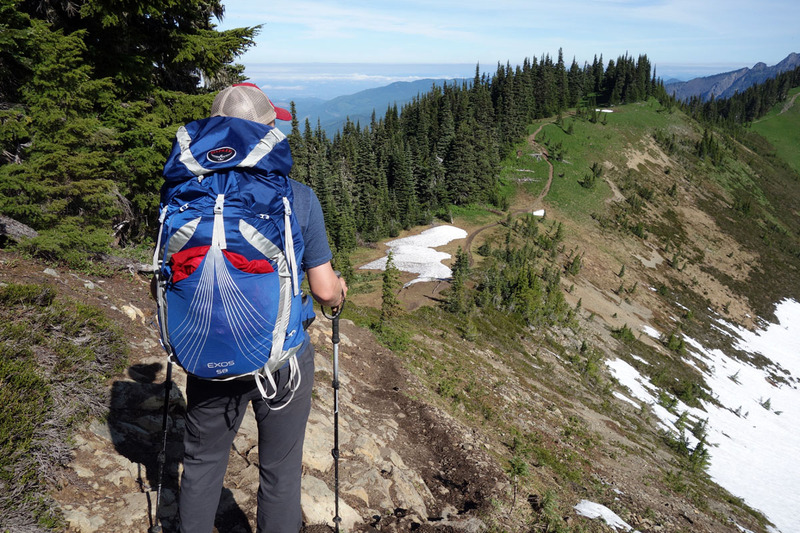 Hiking and backpacking requires a lightweight and durable camera that captures great images. Depending on your budget, the options abound in categories from compact point-and-shoots and mirrorless cameras to full-frame digital SLRs. Quality point-and-shoots for hiking start at just under 8 ounces. Mirrorless cameras start at around 12 ounces for the camera body, while DSLRs start at 13 ounces (plus you'll have to bring at least one lens). It’s not overly difficult to keep your camera protected from the elements with a simple dry bag, but weather-sealed cameras are available both in the “tough” category and on higher-end mirrorless cameras and DSLRs. For more information, see our buying advice below the picks. A number of “tough” or “rugged” cameras are on the market and tout being waterproof, dustproof, freezeproof or crushproof. The piece of mind of not worrying about your camera has value, but these models are expensive and the internal components (the image sensor in particular) are on par with much cheaper point-and-shoots. Rugged cameras are great for activities with serious exposure to the elements such as surfing, rafting, skiing, or rock climbing. For hiking, we prefer to carry a higher-performance, lower-cost camera and protect it inside a small dry sack (or even a Ziploc bag or two). 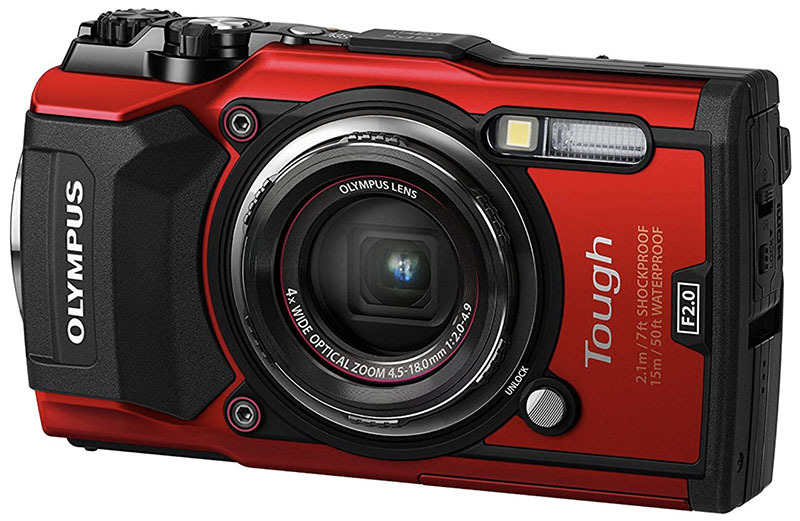 If you do want a rugged camera for hiking and other outdoor pursuits, a nice option is the Olympus Tough TG-5 (8.8 oz.). This camera is waterproof down to 50 feet, dustproof, and can withstand cold temperatures. More, it has a nice 25-100mm zoom range, which goes wider than other tough cameras that generally are 28mm at the wide end, along with a very respectable f/2.0 maximum aperture for low light and underwater photos. On the flip side, the weaknesses of the TG-5 are its small image sensor and high price tag. You can find better performance and value with the point-and-shoots below, but rugged cameras do afford you the luxury of not having to worry about your gear in the outdoors. For recreational hikers and photographers, point-and-shoot cameras are great for keeping your pack light and still capturing good images. It’s hard to match the image quality of a mirrorless camera or DSLR (see below), but point-and-shoots continue to advance with larger image sensors, more megapixels, and more features. They also are the lightest and cheapest cameras on the market. In terms of point-and-shoots for hiking, the conversation starts with Sony’s highly successful RX100 series. 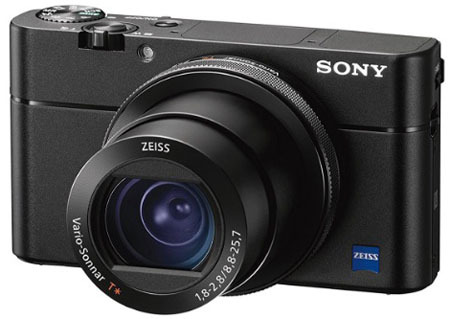 The latest version, the Sony RX100 V (10.6 oz. ), is consistently rated on this site and others as one of the best point-and-shoots on the market. With an extra large sensor, a high-quality Carl Zeiss lens, 4K video, and RAW capability, it’s an excellent—albeit pricey—option for hikers. But nearly $1,000 is a lot to spend for a point-and-shoot, especially for heavy outdoor use (with proper care damage is unlikely but always a possibility). For those looking to save, the original Sony RX100 is a great value. It doesn’t have an electronic viewfinder, 4K video, or built-in Wi-Fi, but is very similar to the RX100 IV in terms of image quality and less than half the price. Keep in mind that the RX100 has a different zoom range at 28-100mm instead of 24-70mm on the V.
The most intriguing point-and-shoot on the list is lesser known but a terrific option: the Ricoh GR II (7.8 ounces). Most notable is its huge APS-C image sensor, the same size as most DSLRs (veteran photographers know that the sensor is much more important than megapixels in producing great images). This Ricoh GR II has a fixed focal length lens (no zoom) equivalent to 28mm on a 35mm camera, which is ideal for hiking and the outdoors. And the cherry on top: the GR II has steadily been priced at $700 but recently dropped in price to below $600 (about $350 cheaper than the RX100 V). For hiking and backpacking, we like the features that Sony offers but prefer the huge image sensor on the GR II. A number of professional landscape photographers carry this camera for hiking and with good reason. We were very excited about last year’s announcement of the new Nikon DL 18-50 (12.8 oz.). For outdoor photographers, the DL 18-50 was a dream: it offered a true ultra-wide-angle lens for landscape shots equivalent to 18-50mm on a 35mm camera. In addition, it had a fast maximum aperture of f/1.8-2.8 and a Nano Crystal Coat to prevent ghosting and flare. Instead of competitors like the RX100 V at 24mm and Ricoh GR II at 28mm, the Nikon DL 18-50 went considerably wider at 18mm and we loved that capability. However, due to factors like the Japan earthquake and rumored technical issues, Nikon’s entire DL series was cancelled in early 2017. That was a disappointing development to say the least as we had high hopes for this camera, but we are optimistic that another brand will come to the plate with a true wide-angle point-and-shoot for outdoor enthusiasts. We will let you know here as soon as they do. Mirrorless cameras offer DSLR-like image sensors in compact bodies—they are larger than point-and-shoots but smaller than DSLRs. This is an intriguing option for hikers who want professional-grade photos without the bulk. Many professional landscape photographers we know have made the switch to mirrorless due to the smaller size and lower weight, but keep in mind that the cost of these cameras is similar to a DSLR if not slightly higher. 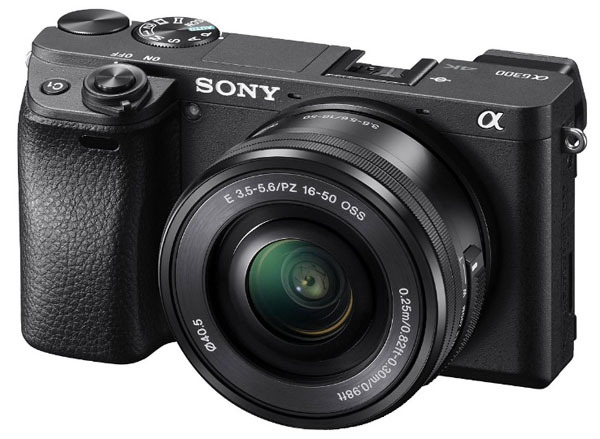 Sony still is leading the charge in mirrorless camera systems, and our top pick for hikers is the Sony Alpha a6300 (14.8 oz). We know a number of professionals that carry this camera as a lightweight option for serious excursions into the backcountry. Most importantly, the a6300 has an APS-C image sensor that will far outperform a point-and-shoots but the camera is lighter and more compact than a DSLR. It doesn’t have an electronic viewfinder and the 16-50mm kit lens isn’t very impressive (you’ll need to spend more for quality lenses), but the a6300 takes great stills, shoots 4K video, and is weather sealed. Another option in this line is the new Sony Alpha a6500, which adds in-body image stabilization but is about $500 more. For outdoor use, we prefer to save with the a6300 or go with the older Sony Alpha a6000, which currently is selling at a significant discount. The sacrifices of going with the a6000 include no weather sealing, which can be very helpful for outdoor photography, no 4K video, and inferior autofocus. For outstanding image quality and protection from the elements, we like the Olympus OM-D E-M5 Mark II. Yes, the new OM-D E-M1 Mark II sits at the top of Olympus’s lineup—and it truly is a fantastic camera—but for hiking we don’t need the speed or 4K video (not to mention the nearly $2,000 price tag is a little steep). The makes the E-M5 Mark II our top Micro Four Thirds pick by offering great value, built-in image stabilization, and a weather resistant body. More toward the budget end of the spectrum, the OM-D E-M10 Mark II isn’t weather sealed but has the same image sensor as the pricier E-M5 Mark II. Both are part of the Micro Four Thirds family, which has the widest variety of lens options of any type of mirrorless camera. Another very strong mirrorless option for the outdoors is the Fujifilm X-T2. With Fujifilm cameras you get the truest color rendition on the market and the X-T2 is the whole package: it shoots fantastic images, is weather sealed, and has a more classic feel than the offerings from brands like Sony. And for hiking and backpacking, the Fujifilm X-T20 is a trimmed-down version of the X-T2 that weighs just 13.5 ounces for the body. Again, you don’t get weather sealing on the cheaper version but the image quality is very similar, the camera costs a good deal less, and it’s smaller. 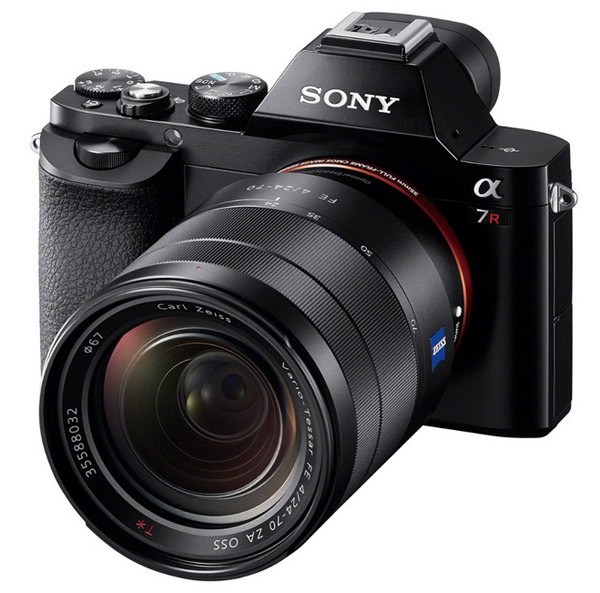 At the top end of the mirrorless spectrum is Sony’s impressive a7 series. These sleek full-frame mirrorless cameras offer professional-grade image quality in lightweight set-ups, and many top pros have made the switch for outdoor photography. Leading the pack is the new Sony a7R II, which features a 42.4-megapixel back-illuminated image sensor, 4K video capability, and built-in image stabilization, all while weighing just 22.1 ounces for the camera body. In addition, the weather sealing and ergonomics of the camera have been improved over the older a7R, including a reinforced mount that can handle larger lenses. If money was no issue and you could have one camera for hiking and backpacking, the a7R II would be it. And keep an eye out for the new Sony a7R III, which hits stores soon and offers faster shooting, improved autofocus, touchscreen functionality, and more. Digital SLRs are the heaviest of all digital cameras, but they also have the best components and widest selection of lenses. For hiking, the lightest DSLRs like the Canon SL1 weigh around 13 ounces for the camera body, while full-frame options like the Nikon D750 weigh 26.5 ounces for the camera body. You definitely are making a sacrifice in choosing a DSLR for hiking in terms of weight and bulk, but it may be worth it for the image quality and use off the trail. For entry-level DSLRs, both Nikon and Canon offer lightweight models that can compete with mirrorless. The 24.2-megapixel Nikon D3400 weighs only 15.1 ounces for the camera body, and the 18-55mm VR II kit lens has been trimmed down by about 20%. From Canon, the Rebel SL2 is one of the smallest and lightest DSLRs ever made, weighing 14.3 ounces without a lens. Neither model is weather sealed, but both offer excellent image quality and easy-to-use functionality from two of the best in the business. 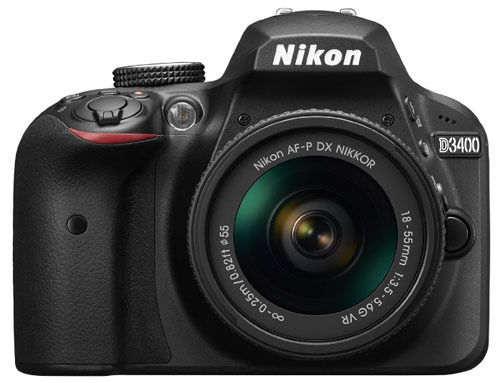 A step up from those cameras is the Nikon D5500 (14.8 oz.) and Canon Rebel T7i (19.9 oz. ), which offer more in the way of features but cost more too. It’s worth noting that Pentax makes a number of entry-level DSLRs with weather sealing, which is unique to the industry. The Pentax K-S2 is one reasonably priced option, although it does weigh 21.8 ounces and the lens options are inferior to those available for Canon or Nikon. In the “prosumer” or enthusiast DSLR category comes weather sealing, an important consideration for those who spend a significant amount of time outdoors. The Nikon D7200 (27 oz.) 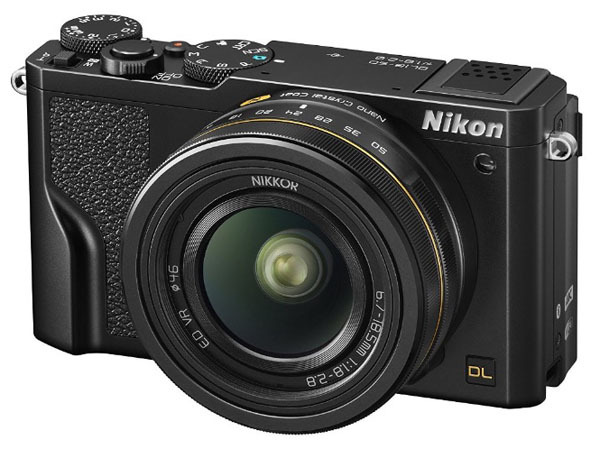 is Nikon’s leading APS-C format camera, and compared to cheaper Nikon DSLRs like the D3400 above, it shoots faster, has a more advanced autofocus, performs better in low light, and is weather sealed. Canon’s leading APS-C format camera is the 20.2-megapixel Canon 7D Mark II (32.1 oz. ), an outstanding camera in its own right. Compared to the Nikon D7200, the 7D Mark II is heavier but boasts the best autofocus and fastest shooting of any crop-frame DSLR. For those who want image quality to rival the professionals, full-frame DSLRs are the cream of the crop. Designed to appeal to a broader base of consumers, a new class of "budget" full-frame DSLRs has emerged, including the Nikon D750 (26.4 oz.) 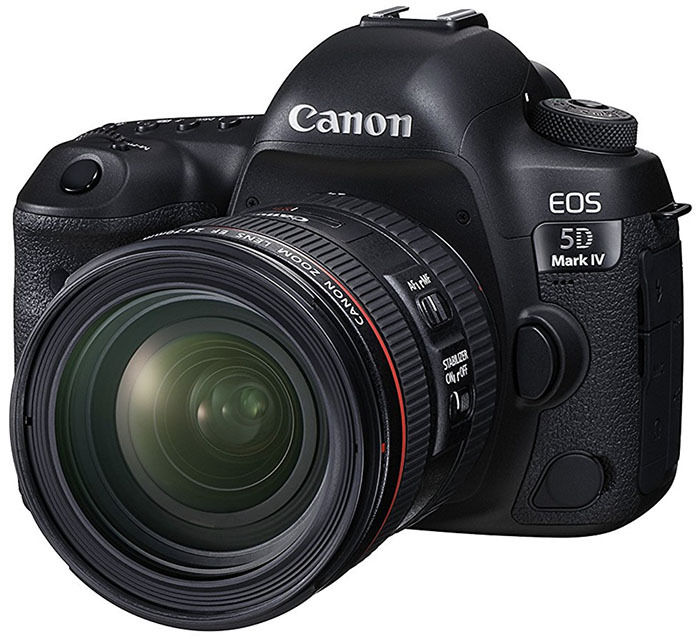 and Canon 6D Mark II (26.8 oz.). Both are weather sealed and offer excellent image quality at relatively low price points for full-frame cameras. Again, the carrying weight here in heavier than we prefer but they are terrific cameras overall. Two of the top full-frame cameras in the world are the Nikon D850 (32.3 oz.) and Canon 5D Mark IV (28.2 oz.). The Nikon D850 wins in megapixels (45.7 vs. 30.4 on the Mark IV), but the difference will not become apparent unless you are making large prints. 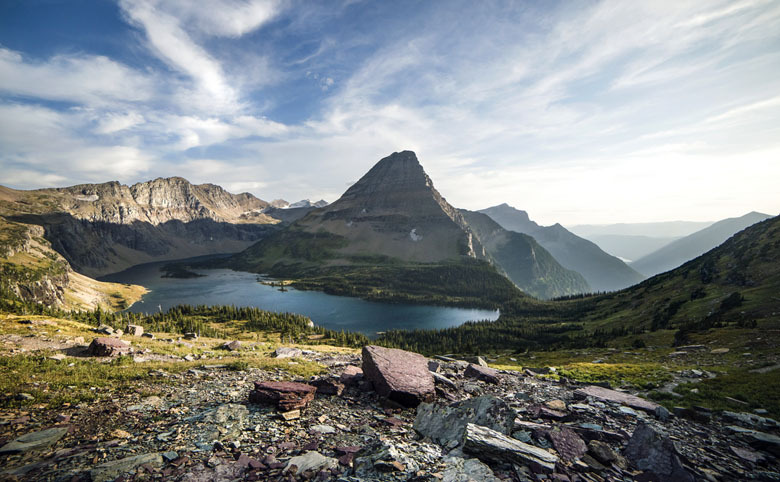 For hiking, both cameras are quite heavy even without lenses or a camera bag, but many who want top-of-the-line image quality are willing to carry the extra weight. We’ve carried these types of full-frame cameras many times on hikes and backpacking trips but transitioned to slightly lighter full-frame mirrorless options like the Sony a7R II. In terms of resolution for still photography, Canon took a huge step forward with the release of the Canon 5DS R (29.8 oz.). Most impressive is the 50.6 megapixels of resolution, which surpasses the 5D Mark IV by 20.2 megapixels and tops the Nikon D850 by 4.9 megapixels. Video shooters should keep in mind that this camera is designed primarily for still photography without video-centric features like headphone sockets or an HDMI output. It’s also heavy for our taste at nearly 30 ounces, although it’s lighter than the Nikon D850. These issues aside, the 5DS R will produce the highest resolution stills of any DSLR on the market. 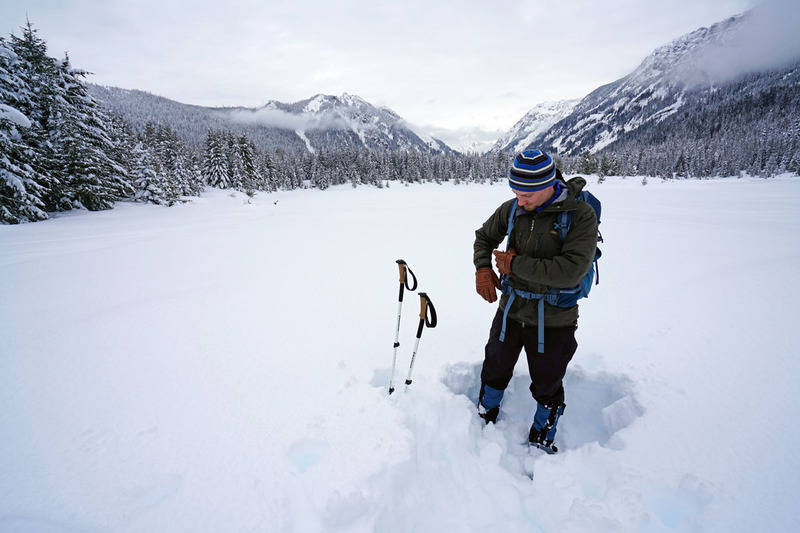 One consideration when choosing a camera for hiking and backpacking is weather sealing. There isn’t a universal standard for weather sealing, but generally the joints and buttons of the camera body are covered and sealed with rubber to reduce exposure to moisture and dust. Even with weather sealing, we definitely don’t recommend shooting in a sustained downpour as water eventually can get through, but weather sealing can be very helpful in light to moderate precipitation. If you’re a professional who shoots outdoors, it’s almost a must. Aside from the “tough” waterproof models, which are fun but not competitive from an optical standpoint, no point-and-shoots are weather sealed. Even with a high-end compact like the Sony RX100 V, you don’t get this feature. In terms of DSLRs and mirrorless cameras, weather sealing is available on some mid-range models and almost all full-frame models. Because of the importance of this feature, we’ve included weather sealing in our comparison tables within this article. And for complete lists of options, see our pages on weather-sealed DSLRs and weather-sealed mirrorless cameras. For outdoor photographers, your lens is just as important as the camera itself. For example, it would be mistake to buy a DSLR or mirrorless camera with only the 18-55mm kit lens and expect professional quality landscape photos. Most likely, you’ll want a good wide-angle lens, or at least a quality zoom that performs well at the wide end (most kit lenses are pretty marginal at the wide end). Assuming most hiking photos are of the landscape variety, we think that 16mm to 24mm is the optimal focal length range. Anything wider and you’ll need a big, open expanse and strategic use of foreground (the header photo for this article was shot at 14mm and has both characteristics, but ultra-wide-angle photography has a high degree of difficulty). As you move narrower than 24mm, you’ll start to lose the dramatic openness that makes landscape shots so appealing. People and wildlife photos are shot are normal and telephoto focal lengths, but for hiking we love the 16mm to 24mm range. For a detailed analysis of this topic, see our article on lenses and focal lengths for landscapes. In terms of point-and-shoots, keep an eye on the listed zoom range. Aside from the Nikon DL 18-50mm, which effectively doesn’t exist at this point (although we hope it will in the future), most point-and-shoots are 24mm at the wide end or narrower. The Olympus TG-870 is an exception at 21mm, but for hiking we prefer a camera with a larger sensor. The standard 24mm is serviceable but not optimal for landscape photography, and it’s one compromise of going with a point-and-shoot. When buying lenses for your mirrorless camera or DSLR, make sure to find the 35mm equivalent. Most DSLRs and mirrorless cameras of the APS-C variety are offered with 18-55mm kit lenses, which are equivalent to 27-82.5mm for Nikon and 29-88mm for Canon, for example. This means that for the best hiking photos, you’ll almost certainly want to add a true wide-angle lens. Yes, it adds cost and weight to the mix, but the final product will be substantially better both in terms of field of view and image quality. For more on this topic, including matching lenses to your specific camera, see our detailed lens reviews. No matter which type of camera you choose, this small hunk of metal, plastic, and glass has to be carried in your pack wherever you go. Therefore hikers and backpackers always are looking at ways to shave ounces while still getting the photo quality they want. Point-and-shoots are the lightest of all camera options, starting at around 8 ounces including a battery and memory card. As discussed above, point-and-shoots also have the smallest sensors and the lenses and don’t go as wide as most landscape photographers prefer. Moving up to interchangeable-lens cameras, mirrorless models start at around 12 ounces for the camera body (the Sony Alpha a6000) up to 22 ounces for the full-frame Sony Alpha a7R II. Digital SLRs are the heaviest of the bunch, ranging from 13 ounces (Canon Rebel SL1) up to 32 ounces for the Canon 7D Mark II. Depending of which lenses you choose and how many, you should expect your interchangeable-lens set-up to weigh from around 2 pounds at the low end up to 5 pounds or more for a full-frame camera with multiple lenses. Here’s our take: Get the camera you want taking weight into account, but don’t fret over it too much. There are no shortcuts to capturing great photos in the wilderness: you either bring nothing or your phone and get photos that are mediocre at best, or you add a little weight to your bag and get professional-grade images that can be framed and hung on your wall for a lifetime. We’ve known a number of professionals who keep trying to go lighter and smaller but end up back with the full-frame brick in their pack. At the end of the day, it’s worth it for those who have a serious interest in photography. An old saying in photography is, “The best camera is the one you have with you.” When choosing a camera for hiking, make sure to pick an option that will be accessible. Professional photographers are willing to stop and take the time to take out their DSLR or mirrorless interchangeable-lens camera for a shoot, but having a complicated set-up can equate to fewer photos (and therefore fewer good photos). Optimally you have a camera like the Ricoh GR II in a side pocket or hip belt, and a more serious DSLR or mirrorless camera in your backpack. That way you don’t miss the fleeting photo opportunities but can unpack the heavy artillery for epic shots or when you’re already stopped. Regardless of your hiking camera choice, make sure to have it accessible enough that you’re using it. The best photos often aren’t anticipated.